A stable, low-profile design has made the Tarn 2 huge with backpacking, biking and paddling twosomes, and with soloists who like sprawl. New cam cleat tensioners let you adjust the guy lines without the tedious pulling-and-threading of traditional tighteners. A new cinch-down style stuff stack makes packing the tent up so simple and fast, you’ll be able to do it before your second cup of coffee is brewed. Pull-out vestibule for storage or stripping off wet rain gear. Poles attach with clips for lightness, fast set-up, and air circulation. The first time I ever set this tent up in the ‘field’ was at midnight at a campground in Botswana. It’s a simple design and really easy to setup. This is nice for dark or stormy conditions..or if you’re really tired…or if you’re on your way down a mountain and celebrating a badass assent and had a couple of beverages! The tent takes a quick 5 minutes to setup and 5 to take down and pack. Simple! 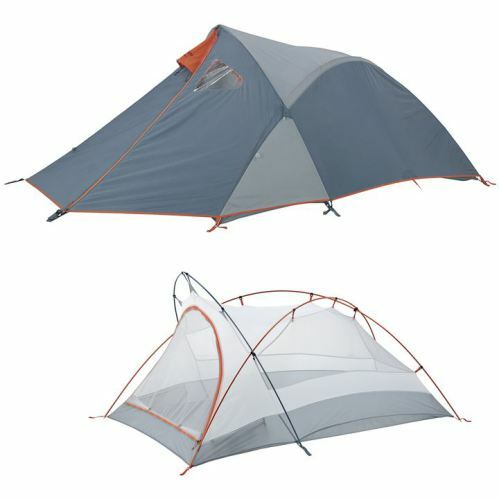 The Tarn 2 from MEC is advertised as a 2 man tent. This might scrape by as a 2 manner if you have little to no gear, sleep in a straight line and you’re both averaged sized people. The door placement means you’re waking up your buddy every time. It will fit 2 thermarests, sleeping bags and perhaps 2 small packs, but calling this a 2 man tent is kinda crazy. Perhaps a man and man’s best friend? You cannot stand in this tent, so for changing etc, you’ll be doing that sitting up or laying down. I have an 80L pack and it fit perfectly into the main container. It’s pretty lightweight and the whole unit fits in one compact bag that they provide. This is a great tent if you’re pack backing. The fly/vestibule is great to keep weather and condensation from the main tent. The vestibule is great to keep dirty gear, boots etc out of tent, but still protected from the rain and elements. Besides the size exaggeration, the only other negative thing I have to say is that there could be more ventilation options. There’s a couple of mesh gaps and then the mesh door option, but nothing much for blow through. This model has great rep for being stellar in all kinds of weather. though I haven’t been in any amount of snow or high winds as of yet, I can say that in the rain, cold & heat, it held up great with no leaks. The kit comes with a repair kit for rips or tear damage. Bonus! Here’s a video that MEC put out on how to set this sucker up!